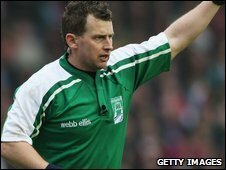 Nigel Owens will become the second official to take charge of back-to-back Heineken Cup finals when he officiates the Leicester versus Leinster showdown. The Welsh World Cup official, appointed as an international referee in 2005, will be the man in the middle for the 23 May final at Murrayfield. Christophe Berdos of France has been named as the fourth official. English referee Chris White is the only other official to have taken charge of successive Heineken Cup finals.